Baby Hazel and her mom are in the grocery store to buy the some kitchen tools and ingredients. Her mom is buying the tools and ingredients to prepare some delicious meal for the baby. Baby Hazel is a very intelligent and brilliant baby. The baby's wish is to help her mom. Her mother does not want to disappoint her baby, so she accepted her request. 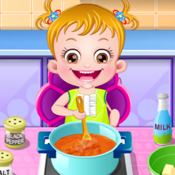 Since she is a baby, she may not be able to pick the right tools or ingredients and even she may not be able to work in the kitchen, so her mom wants you to monitor and guide her baby.